Before exploring the API, let’s review the List data model. A Location may have multiple Lists of a given type. 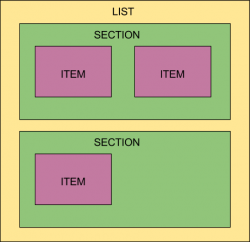 Each List object has one or more Section objects, and each Section object has one or more Item objects. Event List objects can contain only one Section (with name = “”). We highly recommend creating Lists within the dashboard to explore all the functionality. The key differences between the four types is mostly at the Item level and one or two fields at the List level. For example, Menus and Product List objects have a currencyCode and their corresponding Item objects have price fields, but Bio Lists and Event Lists do not. Likewise, an Event Lists’ Item object has date fields (starts and ends). Now that we’ve covered the List model, let’s try creating a List through the API. In this guide, we will walk through creating a Menu. If you want to practice creating another List, the calls below can be substituted with the corresponding endpoint for that List type and with the minor changes needed to the request body. As noted earlier, we highly recommend creating your desired List in the dashboard first and then retrieving it (see “View an Existing List’s Data” later in this guide) so that you don’t have to construct the data model from scratch. Let’s begin! To create a Menu, you must use the Menu: Create request. The request body will contain the Menu data. Try creating another Menu and changing and adding some of the fields above. Now that you’ve created a few Lists, let’s try updating the content of the first breakfast Menu you created. To update a Menu, you must use the Menu: Update request. The request body for this request will once again contain all the Menu data. In the example below, we will add an additional item to the “Pancakes” section. If the Menu exists, you will receive a 200 response with the Menu’s data returned in the response body. If the request above is successful, you will receive a 201 response with an empty body. You can verify that the List was associated with the Location by issuing a Location: GET request. Yext will syndicate your Menu to the Knowledge Network if its publish field is set to true. So, if you add a List with the publish field set to false, that List will not be syndicated to the the Knowledge Network and will not appear on any of your listings. The menuLabel field contains the hyperlink text that is shown on your listings. In our example, consumers will see a button with the words “Restaurant Menus” when viewing your listing on a publisher site. When they click on the button, all of the Menus that are both published and associated with the listing’s location will be displayed. NOTE: If you have created multiple Menus and associated them with a Location, they will all appear under the same menuLabel on the publisher’s site. To remove this Menu from the Location, you can make another Location: Update request, but this time, omit the Menu’s id from menuIds. As before, you will receive a 201 Success response. Take a moment to add and remove a few Menus from one of your example Locations. You should receive a 200 Success response with an empty body. This completes the Lists guide. Take a shot at creating a few of the other kinds of Lists. The potential uses are tremendous, and the more Lists you add, the richer your listings will be!